Hey everyone. Hope you all had a great week and an even better weekend. I’m Matt and this is the latest installment of The Impact. Paolo Rivera Ends Marvel Exclusive Contract. Focuses on Creator Owned Projects. This week superstar artist Paolo Rivera announced that he would be ending his exclusive contract with Marvel. On his blog Rivera spoke at length about how he came to his decision. So why am I leaving? The short answer: ownership. With the exception of just a few published pieces of art (which belong to other companies), Marvel owns the copyrights to my entire professional portfolio. And why shouldn’t they? I was, of course, compensated fairly for it, and for that I’m grateful – but the sum total of that work is not enough to support me in the distant future. My page rate is essentially the same as when I started at 21, so I’ve decided to invest in myself. What I create in the next decade needs to pay dividends when my vision gets blurry and my hands start to shake (and who knows what else). Now is the time to make that choice, while I’m still young, possess “great power,” but have few responsibilities. And yet, I’m not done with Marvel by any means. They’ve been nothing but supportive throughout my decision, as has been the case throughout my career. I will continue to do covers for them and occasional projects as I see fit, just not exclusively. So what am I going to do with my time? In the short term, I plan on clearing out my commissions list, which dates back to 2008. That will keep me busy while I plan more daunting endeavors. I’m not accepting new names at the moment, but I will in due time. In the long term, I may scour my old emails. I’ve had to turn down some amazing opportunities in the past decade, so I may finally accept some non-Marvel work – it all depends on the creative team and the property. Regardless of what new opportunities come my way, my main focus will be an ambitious, creator-owned project: an original story, sci-fi in nature, with primal themes and a compact cast of characters. It’s far too early to give any details, but it’s something that’s been trickling into my mind (mostly in the shower) for the last 5 years. While I’m sad to see him leave Daredevil, the book is in very capable hands, and I’m really happy to see an artist like Rivera stepping out into the creator owned world. 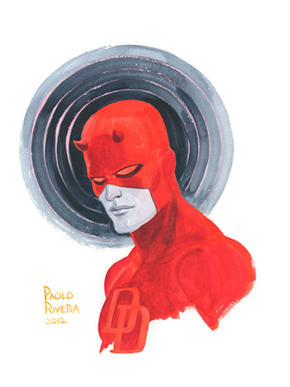 With it sounding like he’s still on great terms with Marvel the door is still open for him to return to Daredevil. 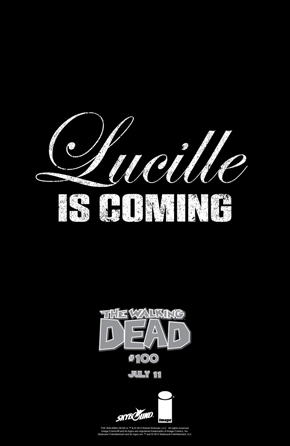 “Lucille is Coming.” Image Tease The Wallking Dead #100. Unveils New Variant. Image released this teaser for the upcoming one-hundredth issue of The Walking Dead. Who is Lucille??? We will have to wait until July 11th to find out. If you can’t wait some stores will be selling the book at midnight you can see if one of your local shops will be doing so HERE. 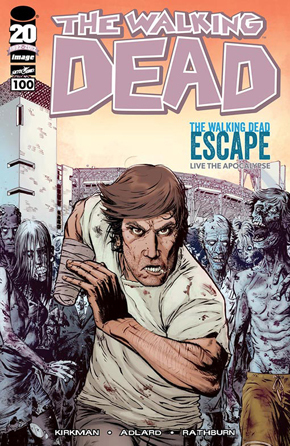 Also check out this variant cover for The Walking Dead #100 by Battle Pope collaborator Matthew Roberts. Hans Zimmer Scores Man Of Steel. Snyder Talks Poignant Release Date. Hans Zimmer was officially announced as the composer for Zack Snyder’s Man of Steel. Ziimer’s involvement has long been considered a given considering his ties to Christopher Nolan, who is producing the film. I think this is a great choice, Zimmer is one of the biggest film composers out there and he is still not afraid to take risks. I hope that the score is something epic, yet still a discernible theme we can hum. Man of Steel hits theaters June 14th which coincidentally enough the 75th anniversary of the release of Action Comics #1. Fourth Trailer to The Dark Knight Rises Hits Courtesy of Nokia. WOW!!! This trailer was a very pleasant surprise. Released as a part of their Nokia promotions this new trailer for The Dark Knight Rises gives us our best look at Batman, Bane and the epic action that awaits us on July 20th. We all know how much Simon is looking forward to this September’s Dredd… That’s how I feel about this movie. Well there you have it guys it was a calmer week this week. The calm before the massive storm that is San Diego Comic Con. Stay tuned as I have a feeling things are about to get crazy. Have a great weekend and I will see you all here next week for an all new installment of The Impact.